One of These Young Designers Will Win Fashion’s Biggest PrizeHere are the 2019 LVMH finalists. Viktor & Rolf’s First Fashion Show Smelled Like Paris’ SubwayThe two fashion designers love the scent of paper. Rachel Comey Makes Herself ComfortableThe designer has built an independent fashion business making other women feel that way too. Zac Posen’s Spring Collection Features Stranger Things’ Maya HawkeThe designer skipped the runway in favor of intimate photographs. The CFDA/Vogue Fashion Fund Has Chosen 10 FinalistsMeet America’s next class of talent. The Designer Who Prefers Pickles to ChocolateErdem Moralioglu on his favorite things. Talking About Taste With Two of NYC’s Coolest New DesignersMeet Lauren Rodriguez and Michael Freels of Lorod. Has This 35-Year-Old Swedish Man Figured Out the Future of Fashion?Meet Oscar Olsson, the mind behind H&M’s new brand for millennials. The Work of Ward Bennett, a Giant of American 20th-Century DesignInside a new monograph of one of the most influential interior designers. Meet the Designer Deconstructing Traditional Chinese TechniquesLujin Zhang is a name to watch. The Nail-Polish Queen Who Jumps Rope on SetJin Soon Choi on what she’s reading, wearing, and listening to. 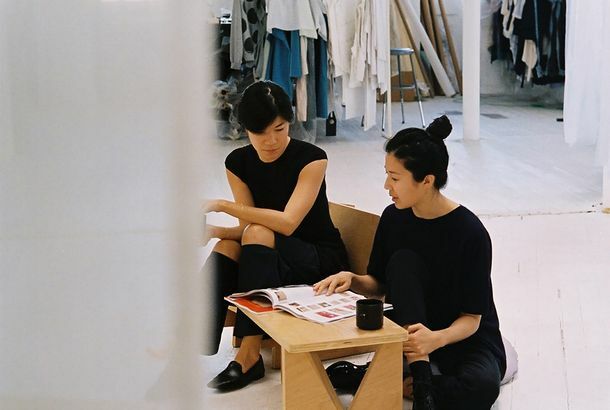 Two Bag-Designing Sisters on Good Sheets, Chocolate, and Tweezing Your Leg HairsKimberly and Nancy Wu from Building Block tell us how to live. An Anti–’It’ Bag for Chic EccentricsIt’s by the Japanese brand Sacai. H&M Announced Erdem Will Be Its Next Designer CollaborationBaz Luhrmann will create movies and images of the collection. Alexander McQueen’s New Ads Take You on an Escape to Rugged IcelandCall it the brand’s version of hygge. Now You Can Decorate Your Apartment Like a Gucci AdThe line of pillows, chairs, and more rolls out in September. Lanvin Hired a New Artistic DirectorThat was fast. Gucci’s New Campaign Is a Dandy Dance Party Featuring Only Black ModelsThe “Soul Scene” campaign is a throwback to the ‘60s. Hood by Air Will Be Going on an Immediate HiatusThe brand announced the news today. Where Did Victoria Beckham’s Smile Go?The fashion industry is apparently to blame. Vivienne Westwood Walked the Vivienne Westwood RunwayRock the catwalk. Here’s Who’s Dressing Melania Trump for the InaugurationThe designer will reach across the aisle — or design room. Now You Can Shop The Row at Its Own TownhouseNaturally, the interior is impeccable. Ann Taylor’s Fall Collection Is Full of Chic Work ClothesGreat coats, pretty dresses, and plenty of suits to make mornings easier. The 20 Best Looks by Francisco Costa at Calvin KleinA look back at the designer’s 12 years with the brand. The Best Red Carpet Moments From Calvin Klein Collection In honor of designer Francisco Costa’s departure. Another Brand Loses Its Creative DirectorAdd Salvatore Ferragamo to the list of those in search of a new designer. Brandon Maxwell Is an LVMH Prize FinalistHe’s up against French brands Koché, Y/Project, and Aalto, among others. Touring New Projects With Two New York Design StarsVisits to 11 Howard, a new hotel, with its creative director, Anda Andrei, and the landmark Manhattan House, refreshed by Vicente Wolf. The Fall 2016 New York Fashion Week CalendarGet a head start on your week of Instagram stalking. See Juergen Teller’s Intimate Louis Vuitton PhotosFollow the fall 2015 collection in the months before and after the show. Courtney Love and Lucky Blue Smith Partied This WeekAlong with David Beckham, Martha Stewart, Selena Gomez, and more in this week’s roundup. Rachel Zoe Paid Her Respects to KitsonTruly the end of an era. Marc Jacobs and Ashley Olsen Partied This WeekAlong with Cara Delevingne, Solange, Sofia Coppola, and Lupita Nyong’o. Rihanna and Lupita Nyong’o Partied This WeekPlus: Kate Moss, Kylie Jenner, Aaron Paul, Lady Gaga, and more in this week’s roundup. Inside Louis Vuitton’s New Exhibit in ParisFrom 19th-century trunks to LV-stamped airplanes. Gwen Stefani and Katy Perry Partied TogetherAlong with Karlie Kloss, Queen Latifah, Iris Apfel, and more in this week’s roundup. Meet the Designer/Surfer Making Waves in WomenswearGet an exclusive look at Thaddeus O’Neil’s first, Anna Wintour–endorsed departure from menswear. Miuccia Prada on Communism and Why She’s Against BeautyShe sat down with critic Alexander Fury for Document Journal’s latest issue. Lorde and Karlie Kloss Partied TogetherPlus: Leonardo DiCaprio, Riccardo Tisci, Selena Gomez, and more in this week’s roundup. Louis Vuitton Wants You to Travel in StyleTheir new app gives you tips for 25 different cities, including Paris, Chicago, and São Paulo. Grimes and Dior Took Over the GuggenheimWith a very pink-and-purple gala. Gigi Hadid and Naomi Campbell Partied TogetherPlus: Lucky Blue Smith, Lady Gaga, Carly Rae Jepsen, Kim Kardashian, and more from Halloween week’s festivities. The 30 Best Looks by Alber Elbaz at LanvinSee all the ruffles, jewel tones, and sparkle. Our 10 Favorite Men from Fantastic ManDavid Beckham, Spike Jonze, and other portraits from the title that changed men’s magazines — and fashion.